I think it was family loyalty that took me along to Avenue Q. That, and some pretty high recommendations on Facebook and She Who Must Be Obeyed telling me to go see it while I still had the chance. Honestly, the idea of yet another bit of children’s pop culture being appropriated for the adult market just wasn’t appealing. But in true Canberra musical theatre style, our ‘amateurs’ have redeemed a rather dry book and presented something truly spectacular. Technically, it was almost faultless. Apart from a few occasions when I couldn’t hear the words over the band, I was blown away by how great these guys sounded. And it was a tiny band too; all I could see were two keys, two strings and a hitter who had plenty of space to rattle about in the pit. The kudos, though, goes to a great cast, most of whom had to learn to control two bodies rather than the usual one. And it was fun just to observe as an audient that at first I had to keep reminding myself to look at the puppet rather than the actor! In time they blended, which just made the whole puppet/puppeteer thing work so well. At least in individual scenes it did. 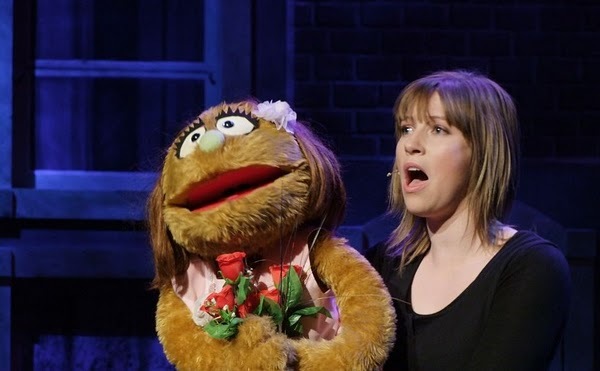 As a whole show, though, Avenue Q just doesn’t hold together very well. Whose story is this? What is it about? And why couldn’t they just pick a story and stick with it? There are some interesting characters here that really deserve better treatment! But that’s musical writers for you; most couldn’t see a story if it played itself out on a stage in front of them! I think, really, Avenue Q is a musical trying to be cutting edge and funny at the same time. It only succeeds in the latter, and occasionally fails at that because it’s trying to be cutting edge. Does that make sense? Probably not, but I know what I mean. And whatever it’s failings, Supa‘s cast and crew have outdone themselves. I had a ball.